With the car packed, and our newly-purchased bicycles in tow, we got a good start this morning on our road trip to the Languedoc. The 90-minute drive from Antibes got us into Aix-en-Provence in time for lunch at the touristy “Les Deux Garçon” on Cours Mirabeau. We also took some time to stroll along the quiet (Sunday) cobbled streets to give Mike a feel for what this charming university town is like. 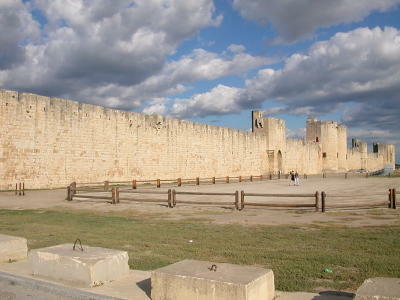 After a quick stop at a colorful roadside market in the Camargue, to pick up some saucisson de taureau (bull sausage) for our impending barge trip, we stopped and spent some time in the very interesting 13th-century fortified town of Aigues-Mortes (Dead Waters), capital of the Petite Camargue. Unfortunately, we arrived just a couple of minutes too late to be able to walk atop the walls surrounding the town. We’ll have to come back when we have more time to spend exploring the area. 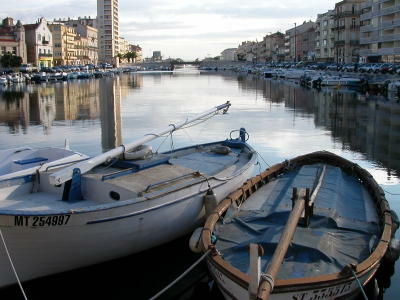 We arrived at our final destination of the day, the largest French fishing port on the Mediterranean, the city of Sète, which is sometimes referred to as the Venice of the Languedoc, with its beautiful canals and colorful fishing boats. We were lucky to get to stay in the beautiful and elegant Grand Hôtel with its Belle Époque style, overlooking Sète’s Grand Canal.